Get the shine your pride and joy deserves. 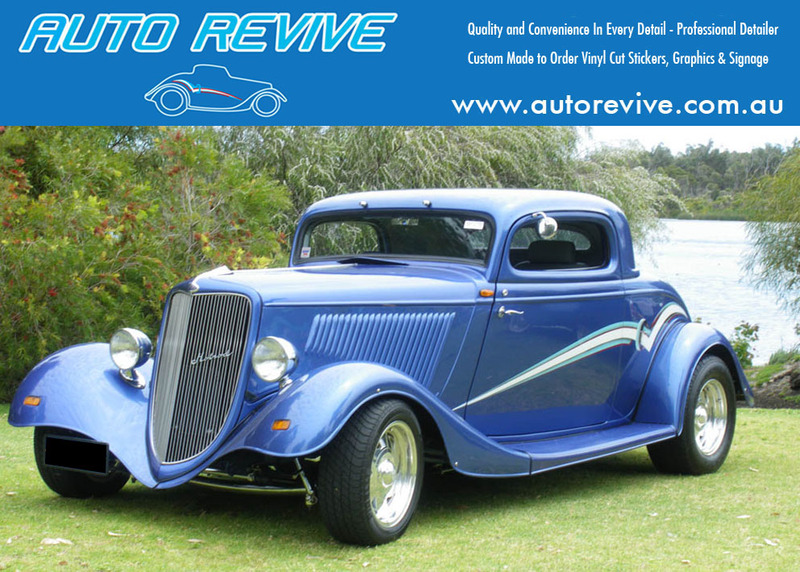 AUTO REVIVE is an Australian-owned and Perth-local business dedicated to providing the best in car detailing. We come direct to our customers and promise nothing but the best service and workmanship. Whatever the vehicle, whatever the vintage and whatever the occasion, we can guarantee satisfaction and a sparkling shine. I have been doing car detailing in Perth for over 30 years. A quality detail will improve the appearance of your car and will help to preserve the resale value. Operating in Cockburn, Fremantle, Melville*,Fremantle and surrounds, we offer mobile car detailing, cleaning and reconditioning services of the highest professional standard. Too busy to do it yourself? Looking to sell your car? Let AUTO REVIVE detail your car for you. Always providing excellence in the mobile car detailing industry and always striving for perfection is our mission. I take pride in every job and use only the latest technologies, latest techniques the highest quality products including Mothers polishes and waxes and Meguires paint and interior care products. With every season change it’s always a good idea to tend to your car. Every three months, it’s good to give your vehicle a shampoo wash, a paint clean and detail and a brand new application of protective wax. This will prepare your car for the change in weather conditions, protect it from the elements and maintain its value. I’m passionate about vehicle presentation and always strive to revive your car inside and out. My own 1934 Ford Coupe hot rod (above) is proof of this! For me each job as an opportunity to build and nurture a long term relationship with a client and their unique car, and to maintain your asset’s financial and sentimental value. AUTO REVIVE are proud suppliers of custom computer cut vinyl graphics, lettering and vinyl signage for many different applications. We don’t just do cars, we are happy to provide custom vinyl cut decals for trucks, boats, other vehicles and businesses premises. For your convenience we can apply all custom decals at a small additional charge. Or apply yourself and save! DIY application instructions included. Shipping available within Australia. Email me for a free quote, or bring the vehicle to our location to measure up. For an online quote, send us the info for the sticker/decal including text, preferred fonts, graphics or logos. We will also need to know the required sizes and vinyl material colour. Operating in the Perth suburbs of Cockburn, Fremantle and Melville, AUTO REVIVE provides premium-quality mobile car detailing at an affordable price. Imagine the convenience of going to work and coming home to a literally gleaming car, freshly detailed by yours truly. Get the drive of your dreams with one call to 0408 938 457. No Internet Troll Calls SMS messages or emails. as this would be treated as Spam.